Former Wimbledon champion Goran Ivanisevic has been included in Croatia's squad for next month's Davis Cup final against Slovakia. Yet the 35-year-old, who retired four years ago, is not likely to play in the tie in Bratislava from 2-4 December. Croatia captain Nikki Pilic has also picked Ivan Ljubicic, Mario Ancic and Ivo Karlovic in his squad. Slovakia will be represented by Dominik Hrbaty, Karol Beck, Michal Mertinak and Karol Kucera. 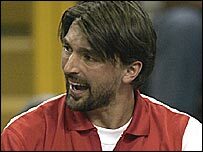 Ivanisevic retired from the men's tour - mainly because of shoulder problems - soon after winning Wimbledon as a wildcard in 2001. He played doubles in the 2003 Davis Cup against the United States and is active on the veterans' circuit. The 35-year-old Ivanisevic had qualified for November's Champions Masters at the Royal Albert Hall. But he has now pulled out because it clashes with the Davis Cup final. Croatia and Slovakia are first-time Davis Cup finalists. Both came through last year's play-offs to earn a place in the 2005 World Group.